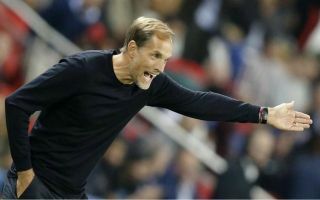 Paris Saint-Germain boss Thomas Tuchel insisted that his side deserved more after losing 3-2 against Liverpool in the Champions League on Tuesday. The latest European Cup campaign kicked off with a bang last night at Anfield, as the Reds earned a famous home win against the French champions. Goals from Daniel Sturridge and James Milner gave Klopp’s men a two-goal advantage in the first half before Thomas Meunier pulled one back just before the break for the visitors. Despite Liverpool dominating large parts of the game, Kylian Mbappe equalised on 83 minutes, to set up a spectacular finale with Roberto Firmino having the final say, The Brazilian came off the bench to lash home the winning goal in injury time, prompting wild scenes of celebration in the stands from the home supporters. After reaching the final last season, the Reds will be bidding to go one step further this term by lifting the trophy for the 6th time in the club’s history and they couldn’t have made a better start in their latest bid for glory. According to Sky Sports, however, post-match Tuchel gave his surprising take on the game, stating that Liverpool’s win wasn’t logical and insisting that his team were good value for at least a point, as he told reporters: “Maybe the score did not really tell the story of the game. “Julian Draxler had a chance to win the game before Liverpool got their goal. For me, the score was not logical or correct. “We conceded two goals in the first half but never at any point did we lose our confidence. We showed a lot of bravery, a lot of mental strength. “Maybe in the second half we started to give the ball away a little too easily, but this is Anfield. “Jurgen Klopp has worked with his team for four years now. This is what Liverpool do, they press and they make it hard for you in possession. “But we never lost our shape. We still managed to maintain two clear lines. We didn’t give too much space between the defensive and midfield line. It is difficult to agree with the German’s comments, given the fact that PSG struggled to cope with Liverpool’s high-pressing game and intensity throughout the match, but they did come agonisingly close to leaving Merseyside with a credible point at one of the most intimidating venues in European football. On matchday two in October, Klopp will prepare his side for a trip to Belgrade to face Red Star, where they will be expected to pick up another three points, while PSG will host Napoli looking for their first win in Group C.